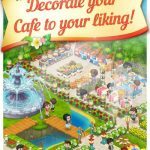 You’ve probably managed restaurants, cafes, and bakeries, but what about crafts shops? Cathy’s Crafts is a new mobile game by GameHouse for Android and iOS that comes with 60 charming levels as you go through the story of Cathy, her “slightly eccentric cat” Ming, and her crafts shop. You’ll be dealing with different customers who enter your store to craft items, assisting them as they try to make more of these items. But you’ll also have to feed Ming “from time to time” – like most any other cat, he tends to get grumpy when hungry, as the game description says! Other features include six different locations and 60 different levels across those locations, 18 trophies to earn, and the ability to customize your shop to your liking. Need some help running that crafts shop? We’ve got all the tips you need here, as this Cathy’s Crafts strategy guide covers all the different aspects of the game. 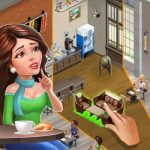 And if you’re wondering about the game’s main mechanic, it’s just as it is in those restaurant/bakery/diner simulators we’ve guided you through in the past – it’s all about time management, and we’d like to help you manage that time in the best way possible. 1. A Backgrounder – How Are You Rated On Levels? Each of the game’s areas have points requirements in order for you to earn stars, with bronze being the lowest star level, followed by silver, then by gold. You won’t have much difficulty reaching gold in the early goings, but once you’ve reached level 5 or so, you’ll have to score a good 2,000 points to earn a bronze star. 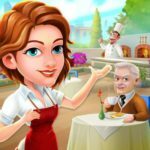 So how do you craft more items to score so many points, and how do you serve all those customers? We’ll be telling you about that in the very next tip. As you may have guessed, it’s going to be all about how well you string those combos together. The combo mechanic works by stringing together identical actions, which could double the points you can get for those actions, or sometimes triple them if you’re lucky. Why serve one customer when you can serve two at the same time? Don’t settle, and take every opportunity available to serve multiple customers. That’s going to get you tons of bonus points, though you have to make sure that you don’t try your customers’ patience too much – always be on the lookout for their patience points! As a bonus tip, the cash register would be a good place to kick off a chain. This works by ringing up more than one customer at the register, just as long as they’ve got money icons hovering over their head. Not only do you get bonus points that could help you earn a gold star faster, you’ll also get tons of cash. When trying to serve customers at your craft shop, you should always be going for those Full Order and Quick bonuses. Full Order bonuses are great, and you can earn them by delivering all of the required items to a table in one go. Quick bonuses, on the other hand, are earned for completing actions quickly, and are thrice as valuable as Full Order bonuses. That means you should be prioritizing speed over multitasking if you’ve got a choice between whether to shoot for a Quick or a Full Order bonus. Yes, it may sound like boring math and numbers, but it’s something you should be paying close attention to. Check Cathy’s forecast for predictions on how many customers are expected to go to the store in a day. Use that forecast to optimize your inventory so that you can meet the expected demand. Look at the avatars of each customer to see what item they would want, and work accordingly as you set up your inventory in such a way that customers get more of the item they want. Keep an especially close eye out on those customers who have low patience ratings, as you’ll need to serve them much sooner than your high patience customers. With that in mind, work on items that are easy to make so that you’re ready to serve them once they enter your store. You can’t expect to serve a lot of customers if your shop isn’t up to speed, so upgrade your shop once you’re able to afford those upgrades. Don’t hoard the cash that you earn; spend it wisely, and spend it on things that can make your shop much better and make your customers far more satisfied than they usually are. Your customers may not like mice roaming around in your shop – who would, anyway? – but they sometimes wouldn’t care less about Ming the cat. That’s Cathy’s pet cat who roams around the store, and granted, there are customers who love that cute feline. There are some customers, though, who hate seeing a cat gallivanting around and strutting his stuff, and you should make absolutely sure that Ming doesn’t make his way to their table. Click on his food bowl ASAP if he starts making his way to the table of a customer who doesn’t like cats. It’s going to take a couple of seconds for Ming to go to his food, so work as quickly as possible to take him away from those curmudgeonly customers; they may not like Ming, but you don’t want to lose their business! This ties in with the above tip, though you can use it in most any other situation in Cathy’s Crafts. If you need a “scouting report” of sorts on your customers, their tendencies, and their behaviors, click on the Customers button on the game’s menu. That will show you everything you need to know about your customers, and that includes whether they’re cat people or not. That’s all for now, as far as our tips and tricks for Cathy’s Crafts are concerned. Do you know other hints for the game, that we should include in this guide? Let us know your thoughts in the comment section below!